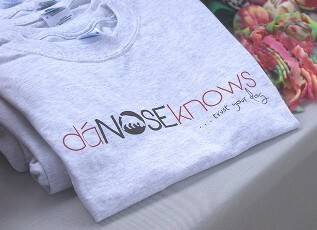 This is our first t-shirt offering and we currently only have it in ash (light gray) with short sleeves. They are 99% Cotton/1% Polyester preshrunk in unisex sizes. Our second T-shirt has wording on the front and back. It’s available in the kiwi green and azalea pink. They are short sleeve, 100% Cotton preshrunk in unisex sizes. This beautiful deep purple, long sleeve t-shirt has a gold foil design. 100% cotton preshrunk in unisex sizes.